Ballsy and reprehensible. So Monica posted the story on her livejournal and the entire thing spread around the internet because it made for great tweet-material. “Writer gets story jacked, then thief asks HER for money!” and so on. 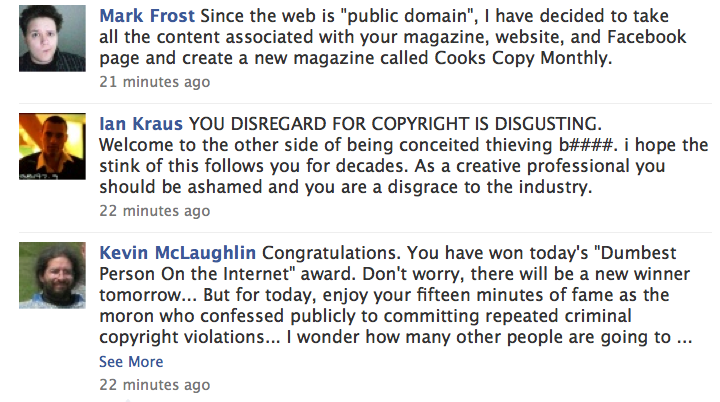 Now Cooks Source Facebook page is getting inundated with derogatory messages from all across the internet. I’ve screencapped a few of them, seeing as how I anticipate the page will be taken down by the end of the day. I confess there’s something gratifying about seeing this completely unknown magazine burned in metaphorical effigy for their incompetence. People are threatening to make phone calls and e-mails to the magazine’s advertisers, and undoubtedly, some already have. There will likely be real-life consequences for the magazine and for Griggs, and they will be well-deserved. Still, I can’t help but wonder how easy it is to rile up the mob these days. I have every bit of faith in Monica’s integrity, but nonetheless, all it takes is for someone to claim that you said some crazy sh*t in some e-mail to turn the collective might of the internet against you. 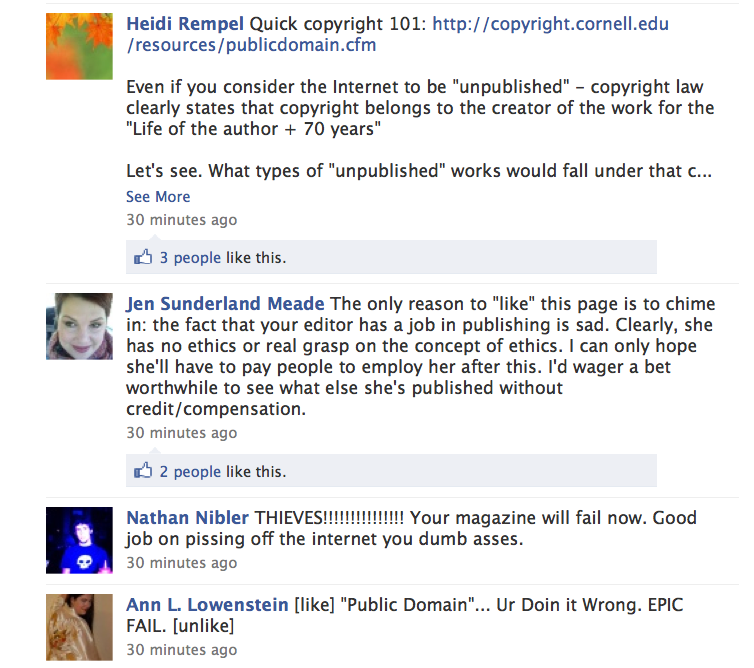 Update: Looks like the good folks at Reddit are investigating other instances of plagiarism in the magazine. In addition, Facebook users are determining where recipes from the current issue originated from (via onlinejournalismblog). Update 2: In the time since this post was written, this story has gotten even bigger. Time has an interview with Monica and the LATimes has a good breakdown of events.